Where to start with updates on the events of last week? 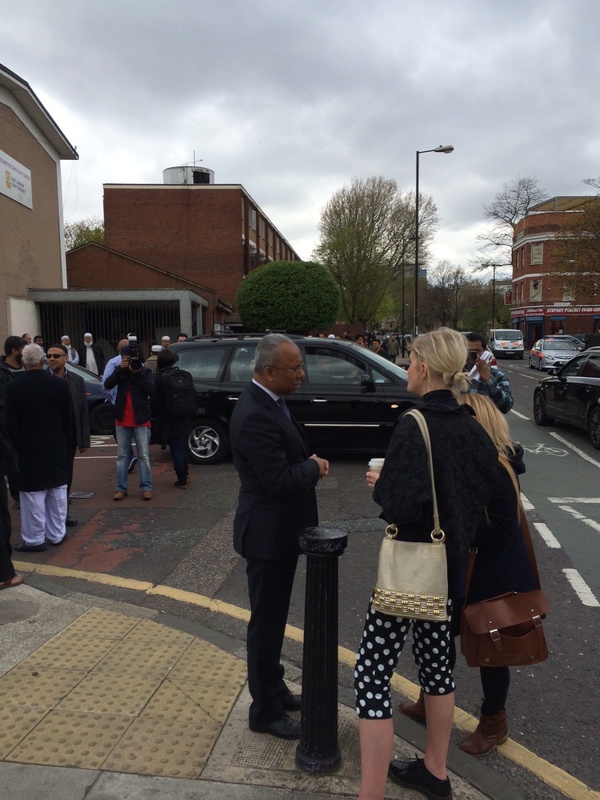 Yesterday, Mayor Lutfur Rahman staged a mini-rally/call for canvassers outside Sir John Cass School in Stepney. I’d been helping out with some spring cleaning at St Dunstan’s Church across the road so I thought I’d pop by to see what was going on. Here’s the male heavy crowd. Thanks to Cllr Gulam Robbani‘s Facebook page we can see the moment I arrived. This is a photo he took of me offering a handshake as he walked towards me. He wasn’t interested in the handshake; he just continued walking towards me, pointing his camera in my face. It was weird. So I took a couple of him instead. But he just carried on snapping. I’m not sure what he thought he was doing (and if you look carefully in the background, you can see Lutfur looking a little concerned about his friend’s erratic behaviour as well) so I gave him the thumb’s up. Someone suggested later I sign an autograph book for him. Like little sheep following one of their more misguided leaders, a few more brave Lutfurites rushed forward to copy him. Cllr Alibor Choudhury also joined in and asked people to take pictures of us together. Here are a couple more of my secret fan club. Don’t you think they do look sheepish? 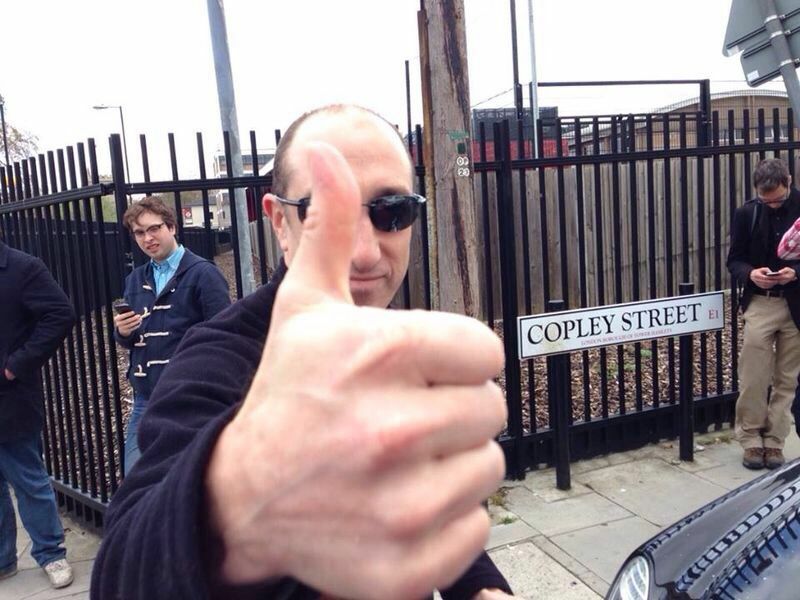 Standing in the background of the ‘thumbs up’ photo is Sebastian Payne, the online editor of the Spectator magazine. He thought it one of the strangest scenes he’d scene at a political rally. I mean, what kind of politician would try and intimidate a journalist? Bit sinister. Seb, in a piece he wrote last night, also said there were a number of other more professional photographers taking photos with long lenses from the park across the way and from the end of the street. Whether these photographers were paid by Lutfur I don’t know, but one or two were jumping to his orders. For example, a couple of minutes after the Great Man himself arrived, one of his men (for they were pretty much all men), spotted a couple of white girls walking past. They pointed this out to Lutfur, so the mayor pounced. Smiling, he rushed over to them. They looked a bit bemused. But he stood there chatting to them for a couple of minutes, just long enough for his cameraman to take enough shots to tick his “diversity” box. And then he walked back to the embraces of his 75 or so committed fans. For the next half hour I was there, he never once more ventured beyond that crowd. While I was watching all this, I did have a pleasant chat with his main man, Cllr Alibor Choudhury. 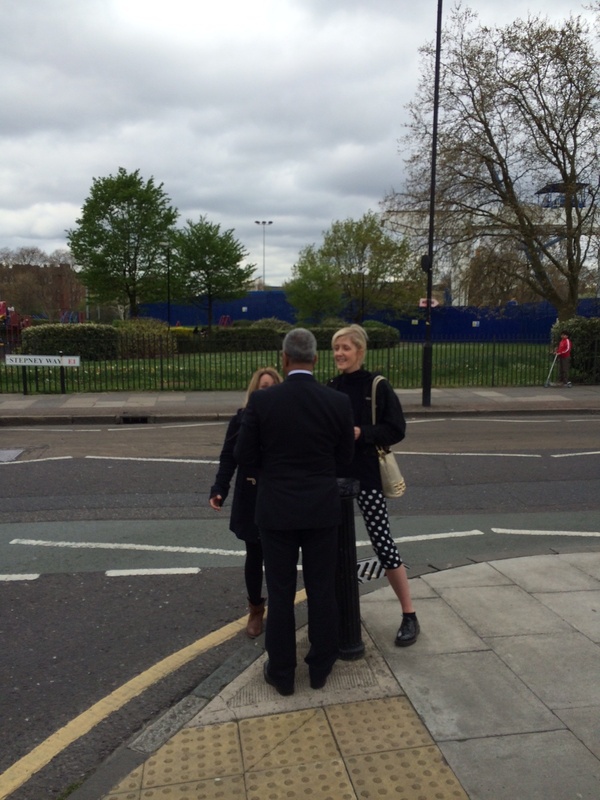 We discussed all manner of things and I repeated an offer for Lutfur to write for this blog. He thought it a lovely idea. He also repeated a statement put out on the council’s website disputing the calculations made by BBC Panorama about the awarding of grants. The BBC said Lutfur had diverted more than £2million of grants towards Bangladeshi or Somali groups to shore up his vote. In fact, in the latest grants round, £1.6million of a £9.7million programme was awarded to organisations with a Bengali or Somali chair, CEO or applicant – or 16.5 per cent to a community that makes up just under 36 per cent of the population. I told Alibor surely the way to settle this is for the council to provide a breakdown of its figures by group. No problem, he said. So I said that’s odd because when I’d asked Takki Sulaiman, the council’s head of communications, for that spreadsheet on Thursday, he’d refused to send it. Takki said if I wanted that breakdown, I’d have to submit a FoI request. How transparent. Alibor said Takki was “wrong”, that I should have been given it. So would Alibor send me it instead? Oh no, said the cabinet member for finance, we’ll have to let Eric Pickles’s inspectors now do their job. He then asked me for my opinion on how last week’s events will affect the May election. I told him I didn’t really know. I said Labour seem buoyed by it and that many Bengalis had expressed deep embarrassment about the antics of Lutfur bhai and co.
Alibor said he was surprised at that and pointed to the favourable coverage the Mayor had received in the hard-hitting, ever-so-scrutinising Bengali media. Here’s a selection of front pages from Thursday’s editions. Some of the headlines read ‘Brave Lutfur’, ‘BBC apologises over Panorama’, etc etc. It’s a free press, I suppose, but they do let themselves and their readers down sometimes with their gullibility. A number of the papers, including the once prestigious Surma, also ran headlines declaring that Jack Straw was now backing Lutfur. “Lutfur is rolling out the sort of progressive programme that I’m in favour of Labour councils initiating,” the former Foreign Secretary was quoted as saying. In fact, these quotes were taken from a rather feeble April Fool gag on Michael Meacher’s blog, Left Futures, published here the morning after Panorama on April 1. There were so many clues this was fake, I won’t bother going into them, but the biggest one of all was the line inserted at the top of the article on Tuesday evening. If I were Labour, I’d be getting Jack Straw to demand an apology and the right of reply in all those papers for the next edition. Labour needs to do better getting its message out to the media. The Bengali community deserves better journalism than this. 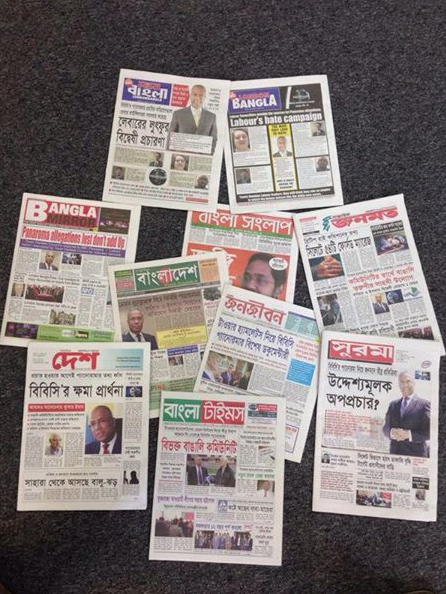 But Lutfur, partly due to the council cash that’s been lobbed their way, has the Bengali press sewn up. Late on Friday afternoon, his two council-paid media advisers, Numan Hussain and Mohammed Jubair (the £50k a year adviser who also works for Channel S) sent out invites for an “emergency press conference” in the town hall. These two, remember, have been behind allegations the BBC was racist. I wasn’t invited, and nor was the East London Advertiser. I’m not aware of any other non-Bengali hacks who were asked to come. In fact, the ELA’s Adam Barnett received a tip-off from another source and made his way to Mulberry Place. Only after he was in the building did the Mayor’s Office ring him and ask if he’d like to come! 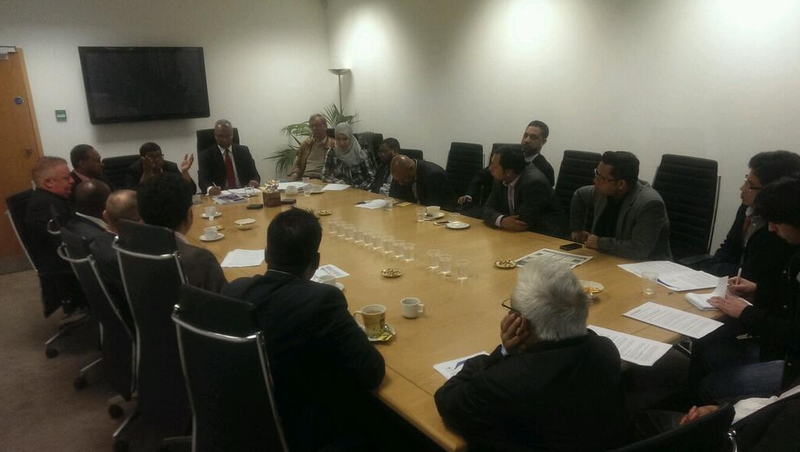 Here’s Lutfur’s photo of the meeting. That’s Stuart Madewell to Lutfur’s left. 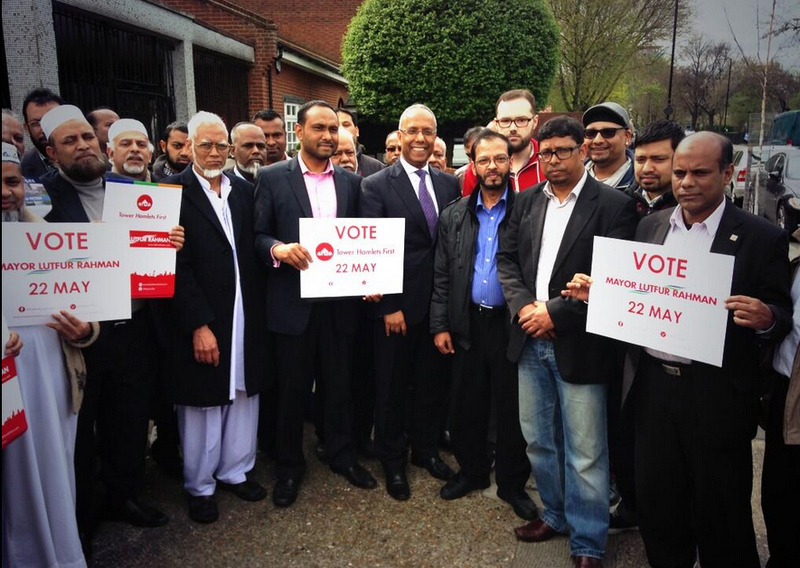 Many of the others in camera shot are councillors or Tower Hamlets First activists. I’m told the “press conference” wasn’t the most biting of affairs, that it was more like a campaign strategy meeting. Can anyone spot what’s missing?? And a someone removing Lutfur’s name from Poplar Baths.